for August 20th are Joyful. You will give to what you love. priceless gift given to you by God. November 4, 1993 - 5:00a.m. Jesus: Today I want to talk about your enemies. To be like Me you must never have any enemies. Does that sound impossible? Every soul is a soul created by Me to love and be loved. When My children are willful and allow Satan to be in control, they become very sinful and do very many unloving things. So why love them if they are sinful? These children need My love more than anyone. All My children need My love, but these children become engulfed in darkness. They continue to only look for their reality in the dark corners and make their world reflect only darkness. This gives them the room to continue in darkness. Darkness to them makes sense. They are surrounded by it. But you come along and you may be with them and you love them. Your light, in contrast to all their darkness, shines out. It makes their dark world have a ringer in it, so to speak. It stops and they take notice. What is this? I hate you and you love me? All I see on TV is surrounded by hate. Their hearts are hate. They look at darkness only. They see only hate and you come along and love? They must take notice of your love in this dark world. What sets you apart, they ask themselves? They may struggle with admitting I am what makes you different, but indeed they must, if they want to really know, admit it is the God in you that makes you love when everything else in their life is hate. So you think your kindness means so little? To a person who only sees darkness, your kindness is as a bright light in the darkest night. The darker the night, the more your little light shines. If people are ugly, who wants to be nice to them? But, you say, why love the unloving? Because that is the way Christ would do it. It is your little light shining in the darkness that makes them have to take notice. Let your light shine. It is I Who shine from you. That is how I reach My sick children in the darkness. They will never come to Me. You may be the only touch they receive from Me. But your touch will not go unnoticed. It is powerful and carries much weight. Even when they continue to hate you, you continue to love. That is My way. Not to get upset in the ugliness of others. That is their way. That is not My way. When they hate you and persecute you for My sake, remember your reward will be great in heaven. I am here, little one. Listen to Me. You do not and never will understand My ways, but My life I give to you as a model to live by. Study Me and know how I am. My ways I make clear to you. To love the unloving is indeed a challenge, but your love may save their souls. Be of Me in all things. Do not get attached to the ugliness of your sick brothers. You know what powers them. Do not get pulled in by their hate. It is not of me. Continue and love and pray for strength. This is My work, to love the unloving. I love you, little ones. Will you be My candle in the dark world? I give you My power and My love. It is not a big job, you say, but it is the job that preaches to those in darkness. Will you preach My love today to your unloving brothers? To be nice to only those who already love is not hard. To be nice to those who are ugly is very hard, but the rewards may be so great for their souls. This is My true job for you, little ones. Love the unloving. They need to be touched by Me. Pray for strength and do what I ask of you and you will know a freedom as you have never before experienced. You are not reacting to their hate. You are still staying fixed in Me. Don't bow to Satan. He wants you to get mean in return. That is Satan's way. My way is the way of love. I am filled with love for you. Come and get your supplies. Spend time pondering My ways. Spend time with Me and get your strength. You need Me to go to the dark world. Without Me you get caught up in their darkness. You need your supplies. Come to Me and you will not run amok. You will run and not get weary. You will fly on eagles' wings and I will love through you. Love the unloving. That is the greatest gift you can give to your sick brothers. I love you. Come that you might do My work and minister to your sick brothers. You can't do it without My supplies. I love you. February 24, 1994 6:00 a.m.
Jesus: I am the Way, the Truth, the Life. He that abides in Me will have the light of life and I will give you life eternal. I come that you might know of Me. I come to save you so that you will some day be with Me in heaven. What glories wait for him who loves and serves the Lord! I am He Whom you do not see, but Who loves you ardently. It is your faith whereby you shall enter heaven. I am here, little one, the same as you are alive. You must learn to trust in Me at all times. This is your testing ground, but, oh, the glories that await you if you pass this test! I am your Savior. I am your lover. I am your all. You need not want for anything if you come to Me. I give you all you need. I never leave you in your trials. I want you to know how close I am to you. I am Jesus Christ, the Son of God, and I am a person. You must focus on Me as you would any person. You must see Me as a real person, dwelling in your midst. I must become so alive to you. You cannot be part My life and part world. To follow Me you must lay down your life and take up your cross. You must die to the world and all it tells you is good for you. This world is a very sick place. Those who are comfortable with its state have become very sick. They do not even see the hollowness of their ways. They do not see that their lives here have become an end in themselves. They do not know that the life necessary for a relationship with Me has gone from their souls. This world is sinful. Your lives are but fleeting moments in the scope of eternity. They are here and then, like smoke, they vanish. I am your God. I am Jesus Christ. I come to you. The closer you come to Me, the more I tell you of Myself. I am sorrowful for what is happening. I love you so much. I want you to know Me as a real person. I want you to turn to Me as you would your intimate lover. I want you to come and share your heart with Me. I am not a God far off. I am Jesus Christ, so present to you this day. I come in such union with you in Communion. Your growth with Me depends on you and how you spend time with Me. If you want to know someone, you must spend much time alone with that person. To your ardent lover, no time is enough. You wait and you anticipate your union. This is what I want with you. I want to be a part of every thought. I want you to run to My arms and pour out your heart. I want you to wait with such eagerness for the time you spend with Me. I want you to make Me the very center of your life. I want every breath you breathe to be for the glory of God. I want your all. I am a jealous God. I want you to be this connected to Me. Your soul craves this union. Nothing here will satisfy it. To strive for union with Me is to live in harmony with the song of the soul. You were created to have this union with Jesus Christ and thus this union leads to such love of Father, Son and Holy Spirit. Jesus Christ is God. To love Him intimately leads to union with God. You cannot separate the Son from God. He is God and God is all three: Father, Son and Holy Spirit. To know Jesus intimately is to know God. But, you will never know God here as you crave. There is this constant longing and aching for more. To know God a little, but never enough! Know there is a restlessness of the soul to behold Him more. The soul will never be satisfied until you obtain heaven. You crave God. The closer your union with Him, the more you want every moment with Him. My ways I make plain to you. My love I give freely. I wait for you as an ardent lover that never goes away. It is you who keep yourself from Me. Every attachment you have to this world keeps you from greater union with Me. I wait for our love affair with every beat of My heart. I love each of you this intently. You are responsible for this union. If you want to be close to Me, give up your attachments. You cannot be attached to things and people and be in proper union with Me. I must be first in your life. Any person or thing you use should be there only as it leads you closer to Jesus. To make anything or anyone so important in your life is to lead you away from Jesus. I must be Number One. The love you have for others comes from your love with Me. Let Me possess your soul. Let Me permeate your being. Let Me use you to do My work. Surrender yourself. The reward that waits for you is so great you will never know. You must realize I am Number One and be busy about our love affair. To know Me, to love Me, is to spend time alone, especially in front of the tabernacle, to spend time alone with Me after Communion. I am closest to you then. I am inside of your body. I am there, God-made-man, inside of your body. Do you want to know and love Me? Then never leave right after Communion. Be absolutely alone with Me! Those moments are so precious. Those are the closest moments you have with Me. You must stay and relish every second. It is so simple, but people have a free will. They place other things before this union. Then they cry, "Lord, Lord, let Me know you." Sit with Me after Communion. Let yourself go entirely. Focus on My intense Love! This is your moment. These are your golden gems. You are My bride and I am the bridegroom of your soul. Do you want to know Me? Come to your lover. I am a person. I am He Who loves you. Treat Me like a person you love so much! Be with Me in your heart. Love Me with action from your heart. Let go as you would experience one you love ardently. Let go and focus on the love between us. I want to love you. I long for you to be close to Me. I am God. I can do all things. You must choose Me first and spend time with Me. People say they want to be close to Me, but they want it on their terms. I come in the busiest moments of your lives and you are missing My love affair with you. You want Me on your terms, in your time. You want a quick time with Me. You don't do that to someone you love. You linger and do not want to leave. You want this attentiveness and you give it to the other person. I want a love affair with you. I want burning love. I want to be Number One in your life. I want you, My little beautiful ones. I am God and I long for you with a heart afire. I long for you with My ardent love. I come to you in Communion. God comes to you and you treat Me so coldly. I love you. I want you. I am eagerly waiting for you and you treat me coldly. You run off to senseless things and pay no heed to God Whom you receive in Communion. How this hurts My aching heart! To love you so much--God-t-o come to you, only to be made light of! You do not know the pain in My heart for such indifference. You do not know how silly you are to run after these senseless things when God is waiting for your silent moments with Him. Busy, busy--and I wait. I grow so tired of speaking because they do not have ears that hear. They want signs and words and what have you and I come into your heart. I share Myself with you in Holy Communion. You, child, behold God in your breast, and you run after senseless things! You want to know God. You want to love God. You want to serve God. Quit the lip service. Sit with Me. It is very simple. You do not know anyone if you never spend time alone with them. Sit after Communion. Alone. You want to do what you want to do. You want Me to fit into your concept of God. To know Me is to be always ready to grow, to open up to the Word of God here and to listen and be taught. I am Jesus. I am telling you in simple terms how to know Me and love Me and really serve Me. You are so willful. You want it your way. That is why you do not listen! Surrender and be taught. Comply with the will of The Father. These prayers are beautiful when they are said for love of Me and My mother and when they come from your heart out of great love! These prayers are cold and offend Me when you decide to do your quota and rattle them off, who knows where, and then say, "Oh, I spent so much time with Jesus." Do I get anything out of this time "with Him"? I do not like this cold prayer. You decide to do an endless stream of prayers, do them to get them in, and then ignore Me all day. I want action from your heart. I want love. I want to be as close to you as an ardent lover. I am a person. I am God. I wait for your love affair with Me this day. Please harken and be with Me. I wait for you with such longing--you and you alone. See My eyes looking on you with such tenderness and longing. See My heart on fire for love of you. Come and be fed in the soul by God himself. No man can ever come close to My love. Nothing can give you what I alone have to give you. Jesus: My child, calm yourself. Live only for love of Me. Live for Me and Me alone. You love Me and I love you. Your love for others will flow from your love for Me. I sustain you. I give you everything you need. Your life is but a breath here. Do not ever focus on it. Remain selfless. Rid yourself constantly of self and operate only to know, love and serve Me. I am Jesus, the Son of God. Oh, little one, such love I have for you. Do you even know? This is not a myth. This is real. I am real. The unseen world is real. It is your faith that will sustain you. I am Jesus, the Son of God, Rita. God is talking to you. You have a job to do for all My beloved ones. I love them so. I want you to tell them of My deep and ardent love. Surrender yourself into the arms of Him Who sustains you. I catch you. I cuddle you and you, child are not suspended in mid-air. You are held tight by the hands of God. I showed you the way, child. I let go on the cross. Life comes only in this surrendering. I let go, I died that I might rise again on Easter! You die to yourself that you will live in My love. You will rise victorious in the love of Jesus. Oh, child, I am so real and I love you. What can I do to tell you how I do love you! Live in My love. Do not judge. Do not spend idle time making yourself better than your brother. Think only of Me and how I love you. You have your job: (1) to love Me with all your heart and (2) to love your brother as yourself. Do not look on your brother with anything but love. How freeing! Love finds a way! Where hate keep you tied to yourselves, loving one and all frees you. Love Me. Love your brothers. They are responsible for their lives. You are responsible for your life. Your job is to love. I call you, My little ones, to love of Me and love of one another. You will answer according to how you loved. You will not be judged on the amount of money you made, on your worldly possessions, on your clean rugs, on your affairs in order. You will answer for how you loved Me and loved your fellow men. You cannot love and remain selfish. Love gives to the other, love is rendering, love in no way demands itself. The world tells you to think of yourself, give yourself pleasure, marry for your self-fulfillment, look out for yourself. The world is focused on self. I tell you that you will be judged on how you loved. Love gives of self. Love is rendering. Love does not demand its way. Love gives to the other. How can marriage work when people are living for themselves. You cannot love and be selfish at the same time. Love does not demand its own way. Love does not seek itself. Love is as I showed you when I died on the cross. I gave My all for love of you, in total surrender. I call you, little ones, to this love. You say, "Oh, is this what you demand?" I say, "Unless you die to yourself, you will not have My life within you." Love never demands its own way. I call you to love of God, love of one another! I showed you the way. I give you all you need to follow My way. You must give Me your life. When you become selfless, you are filled by the love and life of Christ. The life I give is a power so mighty it cannot be contained. It is emitted from your being. You love and live in Me in your being when you strip yourself of yourself. I ask you now to surrender your thoughts, thoughts that constantly go on in your head to make you better than your brothers! Focus on Me and how I love you. Focus on how I am truly alive this day and in your midst and I want to dwell in you in love. Focus on Me. Rid yourself of yourself. Look at every person with love. Do not look with any competition or making yourself better than them. You have your job to do, they have theirs. You are all uniquely created. Each person is perfect and loved dearly by Me. I love your brothers with My Sacred Heart. Love them as I do. I love you in all your weaknesses, in all your flaws. I love you dearly. I do not count your sins. I love you with an ardent love. I love your brothers. I, God, love all your brothers the way I love you. Who are you to look on your brother with thoughts of "he is wrong, I am right"? You are loved so immensely by Me and My Father and the Holy Spirit and the Blessed Lady. You are surrounded by this love! You need not the approval or love of your brother. You need to give love to them! You can do this when you come and sit with Me in front of the tabernacle and after communion. You can do this when you surrender yourselves and live only for love of Me and love of them. You are learning, child. Loving one another is freeing. You are not attached. You are free. You are not attached to your brother and how he responds to you. You love only from the love of God. You are attached to My love and My love never flickers or goes away. My love is always there. I am madly in love with you. Forgive your brother when he is cruel. Love him as I do. Come to Me for your love. I have all you need. Oh, child, you are being taught mighty lessons. The ways of God are so simple, but they are the only way. When you free yourself of your attachments to how others treat you, you will know such mental freedom. You preach My lessons of love in how you model yourself after Me. Love the unloving and preach the message of love. You are My heart in the cold world. I am your lover. You can love because I have loved you first. I love you with a Heart on fire! Come and let Me give you this love this very day! You will love your brothers if you focus on Me. My way is the only way. My way is love! "My Heart is an open furnace of endless love. It is open and on fire for love of you, My dear ones. I held back not one drop of My blood. I spread My arms and gave the last beat of My Heart for you. I come to you in this book with this Heart open. It is a roaring fire, aflame for love of you every second, even when you are not thinking about Me. Read My love letters, written just for you. When you see this Heart, open and on fire, remember I love you in just this way, this very moment." "This is the picture I want in My messages. When you read these messages, look at My picture and know I love you. These messages are My words of love for each of you." Jesus: "I am the Alpha and the Omega. I am He Whose bootstraps you are unworthy to fasten. But I come to you just the same, little one, out of great love to give you many gifts for your soul. Are you ready to receive all I come to bring to you or are you closed? Open the door to your heart and let Me enter into you. Be open and experience My filling you. My relationship with you is no little thing. It is a deep, deep union I want with you. Open your heart. Pray for this union. My Blue Book is a recipe book for this union. I give you here all the ingredients necessary for intimate union with Me -- your submissiveness, your willingness to let Me possess your soul, your time spent in silence in front of the tabernacle, daily mass and Holy Communion, periods of spiritual communion throughout the day, allowing yourself to die to you and to be open to My possessing you and permeating your very being. Do not try to understand the mystery. Feel My mighty love for you and quit looking for answers. You are missing the best part. Oh, how I love you! I give to you from your bounty and you, My child, are made whole. Read my words here. They are a prescription for life, My life deep within your heart. Then the world will truly know Me through you and the light you cast on the darkness." Jesus: I want you to love Me as I love you. If I asked you to lay down your life for Me, you would give this freely of yourself. I need this surrender from you that you put Me above all things--not some things, all things. I am the Lord thy God, thou shalt not have any gods before Me--not your husband, your children, your life, your house. I want your total surrender! I am not asking you to give these things up. I am asking you to love Me more than any of these things, that you are willing to give them up for Me! This is freedom. When your love is for Me and Me alone, no one has any control over you. You live for Me and I am Almighty. I love you with the most ardent love and you know all that comes from Me is from Him Who laid down His life for you. Do you love Me? Would you lay your life down for Me? If you love, you give of yourself. Do you love each other? Do you give of yourself to one another or do you have relationships that give to you? This is not love. Love gives from the heart. Love is for the good of the other. I gave My life for you that you might live. Follow the Master. I did not die for any of My own gratifications, I died to show you how I loved you! I gave My only life for you. I love you this much! I call you to love. Love is action from your heart. Do you love Me this way or do you just do busy work and call it love? To learn about love you must come and be with Me. Sit and let Me teach you My ways. I sit with My red garb, covering My white tunic, you at My feet and I teach you ever so sweetly each day. You are My beloved ones. I died for you. I give you this same love today. Love gives to the other. Do you give this kind of love to Me and your brother or do you ask what others and I will give to you? You do not know love if you do not come and you are not taught by Me. I am the author of love. I teach the mighty lessons of love. I died out of love for you. You cannot love intimately if you hold back. To love Me, you must totally surrender, surrender all you hold on to. People do not love Me because they want to hold back. If you want intimacy with Me, you must be willing to surrender your all to Me. Are you willing to do this? This is where the power is. When you give your all, I possess your soul and I am all powerful. I want your all, not little pieces you stingily let go of. I want your all. Then you will have an intimate union with God. Then you will live in His love and be powered by His might. Then you will be free. I will operate you and you will be united to Me as one. What power, God dwelling within your breast and acting from your soul! Become selfless and unattached to anything. I am God and you shall not have any gods before Me! Jesus: You, My child, are doing as you ought. You think you have to do it all. Let it happen. I do it for you. It is My grace in your heart that makes your relationship with Me grow. You don't have to do it. I tell you what to do. I talk to you. I tell you about Me. You crave to know more about Me because you love Me. I will feed you. You don't have to do the feeding. I will reveal such things you could never find in a million years, a million books. I can tell you in an instant. You are not in charge. I am telling you all you need to know. Don't get bowed down, trust in Me totally. R. My dear Jesus, please write to me if You so desire. I am an empty vessel waiting to be filled by You and the Holy Spirit. I am Your child. You are my Father. Dear Father, please instruct me in Your will. I wait as a child for my direction. I wait on You, Father, Son and Holy Spirit. Come and do with me at this moment as You will. I am Yours, totally Yours. Use me as You wish. I give my life to You. Jesus: You are the child of My Father. The Holy Spirit guides you in all your letters. God fills you. Write, child, as you are told. We are one in God. We are here to help you. Put yourself in My presence and be saved by Me, your beautiful Savior. I am the God of this universe. You are My precious child. I come to you that you might have life. Live in Me and be present to the Father. I am Jesus, Son of the Living God. I wait for you and I want you here with Me. Don't ever wonder about this letter. Just write as I dictate. I will be here for you until the end of the earth. I am Jesus of Nazareth. I am He Who was born of Mary that you might have life eternal. I came to be here for you, you alone. I came for each of you individually. I am a personal God. You must see Me as present to you alone, as being your beautiful lover, Savior, and being there just for you. My heart aches at the indifference of My children. I love My children as you do and I am offended by them, by their lack of interest in God. They have no place for Me in their lives. I hurt so badly because I am a good God and I have so much to give them. I have all they need, but they ignore Me and act as if I don't even exist. This wounds My Sacred Heart. I cry by day and by night, just as you feel such pain when your children have forgotten you. They look at Me as a person who is not there for them when I am ever there. You know what I mean if you have experienced pain with your own loved ones. These are My loved ones, beloved children of My Father, and they are totally indifferent to God. What agony to be waiting for someone and they never come when you have done so much for them. I ache at their indifference and preoccupation. Come little babies, come home to where your heart longs to be. Come to Me. Let Me fill you and lick your wounds. Let Me minister to you. This world is hard and full of hate in people's hearts. I am gentle and kind and ready to love at any second. The world does not feed the soul. I cannot make My willful children come to Me. I give them a free will. I honor their freedom. Love does not demand its way. It yields to the other. I give to you. You choose Me or reject Me, My little babies. If you reject Me, you are rejecting the life for your soul. I am indeed saddened by all this. I am so sorrowful for their actions. I am the author of love and I have all you need to know. Come to Me and I will teach you the greatest lesson-how to love! Do you want to be happy in your hearts? Then you must love God and love each other. I can teach you all you need to know, but you must come to be taught. Love is the key to Me, to each other, to eternal life. Love is the key to life. You have the potential to love as I instruct you. Will you use this key to unlock the hardened hearts or will you continue in your blind ways. Nothing will give you peace in your heart like love. Love frees you from others' hatred. Love gives you all you need. I am He Who teaches love. All love comes from Me first. Any love that is being transmitted on this earth had its origin in Me. Why go to others to find love? Come to the source. I am the source. You get love directly. It is true, it is powerful, it is from the author of love and it is yours for the asking. Come to Me and I will fill you with My love that you might love each other as I do. I love you. Will you come? November 21, 1993 - 4:10a.m. Jesus: Come to Me, you little babies, all who are weary and heavily burdened, and I give you rest. Rest, not as the world gives you rest, but in Me, your divine maker. Oh, ye wander and ye wait in a valley filled with tears and heartaches, but I say know this, little babies: I am Jesus, Son of the Living God. I am here. I am not off somewhere while you trudge this valley alone. I am right in your midst. You do not see Me but you know I am truly real and I am with you. You needn't worry or fume about while you are here. I go every step with you on your way! It isn't as if you are forgotten and you plead and I come sometimes and sometimes I don't. I am here by your side. I am always with you. You need only stop and you will feel My presence with you. You must have faith. You must take your troubles and trust in Me, not a little, but always. You don't let anything Satan puts in your path get really in the way. R. You say this is a big one, hard as can be. But here, Jesus, my love, I stand at the foot of Your cross and I will carry out my work for You. Smiling and being there as You want me to be (smelled roses). I trust in you, Lord! Oh, Blessed Lady! I love you and Jesus. Jesus: Life may seem tough. Life may seem an uphill battle-all the more reason you trust when you are overcome with adversity. Just don't give in to it. Let it go to Jesus and watch how quickly it works itself out. The more you trust and turn everything over, the more you will amazed. Where you operated before so perplexed, you go now and with ease the difficulty dissipates. Only My hand can do such things! Oh, little ones, I love you, love you so. Keep focusing on Me as the doting mother, hovering over the young and you do your part. Picture yourself as a baby who is totally dependent on his mother. He doesn't get up and fix his own bottle. He waits and even takes it when it is too hot or too cold. Sometimes the mother burns his little mouth. He cries but he takes the bottle just the same. You take all I give you-hot and cold bottles, bottles that are just right. If they come from Me they are all out of My great love for you. You keep coming back. You don't say, "I think this one was too hot. I will fix my own" or "I will find another mama to give me what I need." You may cry a bit, but you come right back because you know, just as the baby, how I love you. Turn over the hot ones to Me. Accept them as coming from Me, but don't belabor and worry and try to correct them. Just accept them in the love given and give the worries up to Me. Don't fight off the cold bottles either. Accept them, all of those I give you. When you feel I have forgotten, come to Me on your knees and beg Me to be there. You know, as a mother, I will not forget My baby and if she does forget, know I will never forget! Turn this hot one to Me. It is only a little problem. You can trust totally in Me or worry if you finally have a big problem. Don't worry. Do My work. Know I am here in all your trials, closer and closer, loving you intently as you struggle in the valleys. Know the valleys may be low, but the peaks are there and they are so high and beautiful. It is in the valleys you learn more about Me. It is in the valleys you learn trust and faith. It is in the valleys I am right there with you, looking into your eyes. Your eyes! Oh, keep them focused on Me. Strive to be perfect as My heavenly Father is perfect. Seek after this perfection and holiness. Seek and you shall find, knock and it shall be opened unto you, for I am a God Who loves you so. You will never comprehend even the tiniest amount. The more you trust Me, the more you know Me, the more you see My Sacred Heart, so gentle, so kind, so loving! My Sacred Heart on fire! It radiates such a splendor. It shines like a hot beautiful fire. There is such mystery in a fire that is so deep and so hot. How bright is its center. How hot could it be? That is Me. My heart is on fire with the hottest fire. You wonder how hot is My center. How bright could it be? Brighter and hotter than you could ever imagine in your earthly form! Oh, what glories I have in store for you, when you finally see it all! See all there is to Me. Little glimpses I will give you. They are special treats of My love, but you, in your earthly form, can't even handle it. My power, My light, My fire would blow you off your feet and you would be out cold! That is how I am at your side with a power pack like this and you worry about a power failure? Oh, how silly, when I am with you. Trust, trust, trust! I am here. I am the Good Shepherd. I know Mine and Mine know Me. The sheep follow the shepherd and are led where they need to go. Some go off to do their own grazing. Oh, so sad for them. Sometimes they fall and are totally destroyed! The shepherd is so sad and laments the loss of one sheep, but he tries all he can to get them and bring them back to his flock and they may graze other lands, only to find a very sorry end. Poor little lost sheep. You, My child, are just My little dear baby. Your soul reflects the majesty and love of one Who cares for you. Your eyes are lit by My fires. Your heart is bubbling over with intense fire and this shows in your eyes, your touch, your speech, your smile. You never falter and get downtrodden even in the grandest adversity because I am guarding you. I am by your side. I love you, little one. I am Jesus, your ardent lover, come to you at every second to light your way, even when the bottle is hot. I am there in the hot one. I am there in the cold one. I am there when they are just right. You are taunted by Satan. He hates you, but I am there and he cannot harm you. You will learn trust and faith in Me by handling your cross. Turn to Me and see Me forgiving those who put Me to death, see Me forgiving those who beat Me and tore My flesh and crowned Me with piercing thorns, see Me in all My Blood, covered from head to toe, forgiving those who did this to Me. I am Jesus, Son of the Living God. I live in your trials. I teach in your problems. Embrace all you are given and do not ever turn from Me. Turn toward Me and feel the heat, the comfort, the love! Accept the cross. It is a gift from Me so I can touch you in a special way and give you a teaching. You are taught in your crosses when you accept them with open arms. I am here with all My love. To My death I loved you. I love you no different this day. And I came in all My splendor and you caught a glimpse of My beautiful heart. In rays of light, really aglow, waiting, waiting for you, My love, to come and be united with Me. Unity in the cross, unity in all I sent you and you did not fear and you did not lose your way. You followed the Good Shepherd over the rocks and the thistles that pricked at your little toes, but you kept going. Rocks and thistles, because He knew the way and you were following Him as you ought. The hills were steep, the valleys low. There were times you were dry in your mouth. There was much that was not to your liking, but you followed and followed and, in the end, a beautiful pasture, flowing with a bubbling brook, and a sunny day. Follow Me this way. Don't ask. Don't stop. Don't try to find a way out. Follow Me over the rocks, over all the dry lands, wet lands, lands that are just right. Trust in Me as little sheep. He does not go to graze other lands for he will surely lose his way. Follow, follow, follow the Master and you will never run amok, you will never lose your way, you will fly on eagles' wings. You will run and not get weary, and you will be guarded on your path, the right path that leads down all the right roads to an everlasting treasure. My love is your fuel, My heart your light. You have heat on your journey. Stay close to the center of My heart and all you need will go with you. Alleluia. I am the Good Shepherd. I know Mine and Mine know Me. They follow Me. February 20, 1994 6:30 a.m.
Jesus: You are My beloved child. I come with such strong and ardent love. Cast away Satan who is already working to give you doubt. You must remain constantly steadfast in Me. I am a rock. I am a fortress. I never wane or bend. I am the same this moment as always. Your thoughts of Me need to be this strong. I am the rock. You base all your faith, hope and love in Me. Your mind must be in a constant state of union with Me. This is achieved by thinking of Me, My Love, My death, and how I loved you to My death. Satan wants you bowed down and focused on your imperfections. You are human. You are not perfect. If you have been thoughtless, self-centered, unkind, if you have any impurity, think about them and ask Me to take them away. Then forget them and move on, doing My work. Do not dwell on how you should be perfect, that you are not and are disappointing to Me. That is Satan! You are not perfect. Admit it with humility. You are a creature that thinks of yourself. Selflessness is a constant struggle. Pray for strength and help to become selfless. This is how it is achieved. You do not do it. You pray and practice discipline in yourself. You are not perfect and I love you always. I love you in your faults, just as I love you when you are good. I love you unconditionally. It is pride to think you are perfect. You are not perfect. You are constantly struggling with the ego part of you. Pray to be absorbed in My heart. Pray for union with Me. Pray to die to yourself and remain only in My love. Your actions must always be focused on your love for Me. Constantly tell yourself, "I act only for the love of Jesus. I do this for love of Jesus. I want to do God's will. I do not want to promote myself or feed myself. I do not want to give in to selfish interests, I want to act every moment only for the love of Jesus. I act for the glory of God. I pray for this, to be selfless in God." I am the Alpha. I am the Omega. I am all there is. When you feed yourself, your glory lasts a moment. When you act for the love of Jesus, your love is given to your brothers and your actions are forever imprinted in the journal of heavenly treasures. Do you act for love of Me and Me alone or does the devil tell you that you need recognition for yourself, that you need to be loved by all? I tell you to love God above all things. Do all for the glory of God and all falls into line. Remain selfless and unattached to all things here. Do not be attached to anyone or anything. To do so takes you from Me. Your relationships should be out of love of Me. Love does not seek its own way. It loves the other for the love it can give them. You give My love to others. You should not, therefore, be attached to anyone. I am the beginning. I am the end. He who truly loves Me can let go of every single person or thing and still accept this as the will of God and not lose his peace. Time is so short! Your practice of selflessness will help you for the days ahead. You must pray the Prayer for Union with Me. I am so loving and so good to you! All I send you is from a good and loving God. Accept all you are given from Him Who loved you to His death. I love you, child. Look how those in Medjugorje had to give up all their attachments. Some lost their children. They lost all their clothes and homes. They didn't have clothes to make themselves warm. They did not have food and went hungry! Oh, you don't even know what you are attached to! You think it is little things. It is big things: food, clothes, water, air, children, houses, cars, hot water, cold water--all your comforts. In one second they could be taken from you as they were taken from those in Bosnia. Are you this strong, that you would turn to love of Me rather than despair? I ask you to give up little things, attachments-to-your-comfort things. You will know days of struggle and you will be put to many tests. All the struggles you suffer now will strengthen you for the tough road ahead. Be unattached to any worldly possessions. Be unattached to people. Your top concern is your union with Me and Me alone. You love others only to bring them to Jesus, not to get things for yourself. Do not give in to selfishness. Be totally selfless. Carry the little crosses I give you. They are nothing compared to what is to come. Comfort? Think of doing without water or electricity. Are you attached? Think of wanting food and not having any and watching your children suffer and being unable to give to them. You are so comfortable! You do not have any idea of what you possess. You are so attached and so self-centered. I say to you, die to yourself and to the little things you are so attached to. Give up that cup of tea you so ardently crave. This is to die to self. Do it with great love of Me. Do not share your sacrifice with others. When your mind wants to worry and try to figure things out, give it up to Jesus and continue to do as I ask. Pray and play with your children. You do not need to talk so much. Give up the conversation which pads your ego and play cards with your children even when you want to do your own will. This is to die to oneself, to want so much to check it out, when I am making My way very clear. Check it out in silence with Him Who has all the answers. Why not go to God directly yourself? These jobs I have given you require you to act only for love of Jesus. They require time with Me alone in front of the tabernacle. They require time alone with Me at home. Stop, go to a room, close the door and plug your phone into My Sacred Heart. This will create your dependency on Me. I know all things. I am almighty. I am all powerful. I am loving you every moment and everything you learn from Me is exactly right. Practice this trust in Me. Trust is developed as a staircase to Me. You practice trust, then you turn the next one over and practice trust again, then you, when you are tempted to think and go to others, practice trust and, oh, how our union grows! Pray the Prayer for Union with Me. Oh, I am your support. I am your love. I am the best friend. I have all the answers. I know you. I know your past, your future. I know your heart in ways that you do not know yourself. Turn to Me and Me Alone. Give it all over. Refuse to worry. Refuse to give in to the ego. You need to focus on Me and My love. All things fall into line when you do this. I am God and I am working in your life. You mess it up. Quit working and let Me do as I want. You focus on My love and being My light in the dark world. Satan wants you distracted. He wants you absorbed in everything else and not doing My job for you. Your job is love of God, love of others. Practice letting go. Keep constant union with Me. Oh, how I love thee! If you could only comprehend, you would take your feeble hearts to Me! I am your all. I am your ardent lover. I have all the answers for your life. Oh, little one, I love--LOVE--you! Focus on Me. I can give you the love you are looking for. I can give you your answers. I can give you peace. You will never on this earth have what your soul craves, but you know that I am He Whom you seek. I am the God of your souls. No false gods give you any peace. Come to Me, My beloved. I want you to come to Me. I love you. Jesus Christ. This rosary was received on Wednesday, November 13, 1996 at an International Shepherds of Christ Associates Meeting at Tom Arlinghaus’ farm in Kentucky. The rosary was led by Fr. Edward J. Carter S.J., spiritual director of Shepherds of Christ Ministries. The meditations and messages were given to Rita Ring during the rosary. 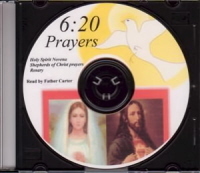 This rosary was received live and transcribed from the recording. This live recording can be obtained by writing Shepherds of Christ Publications. All of these meditations have been discerned by Fr. Edward J. Carter S.J. Messenger: Let us join in one mind and one heart in the Hearts of Jesus and Mary. Let go of all the distractions in our minds and in our hearts. Jesus: I beg you, My beloved ones, to open your heart that I may pour My love and My grace into your heart. I am Jesus. I have called each and every person to this rosary. This is an urgent cry. You are My chosen ones that I am sending into this world to carry My light into the darkness. You are here because I have called you and prompted you to come. Open your heart and let Me speak to you. As you walk with Me through the Passion experience the suffering that I suffered, but know always that the glory of the resurrection is close at hand. In your life you suffer this day, but you know there is the resurrection. The victory has been won. I am pouring into you My abundant life that you will be closer and closer to My Sacred Heart, but you must open your heart and listen to the message that I deliver to you. I love you, My beloved ones. I love you. To My death on the cross, I loved you. Messenger: God is love. We were created in His image and likeness to love and to be loved. He commands us to love God and to love one another. This is not an invitation it is a command from the Almighty God that we must love. We were made for love, to give love, and to receive love. This is what will make us happy. We are the children of God and God is love. Be with Jesus in the garden. Be there. Hear the sounds of the night. Picture the garden as vividly as possible in your mind. Jesus wants us to study pictures when we are meditating on the rosary. Let us create the perfect picture of the garden in our mind. Let us hear the sounds of the night and let us see our beloved Savior, our beloved Jesus, bent over in the garden in utter anguish and pain. Let us go to the Heart of Jesus. Let us feel as Jesus felt in the garden. In our hearts, we know what it is to love someone so much-to love and to give, to love and to give, to love and to give, and how it hurts when we are rejected. How it is utter pain within our hearts. Jesus is love. Jesus loves perfectly. Jesus loved each one of us in the garden. Jesus loved me with the most perfect love. Let us experience the love in His Heart, love and giving from the Heart of Jesus and let us experience the rejection, the indifference, the hatred that Jesus receives from His beloved souls. The Heart of Jesus, a burning furnace of divine love, Jesus loving each one of us perfectly. We do not comprehend the love of our Savior, but we know how we love and how we are hurt when we are rejected, when others do not accept our love. Feel this pain in your heart. Think of Jesus this day in the tabernacle, the Almighty God, all powerful and almighty, remaining in the tabernacle, giving Himself to us in the Eucharist and look at how He is treated! I have heard Him say over and over again, "I give Myself to you! I give Myself to you and I am rejected and forgotten and treated as a dead object." Jesus is alive. How do we treat Jesus? Do we treat Jesus as He is alive. Jesus, Who longs and thirsts for our love. Jesus, Who is love Himself, how is He treated? He has chosen His beloved priests. He has anointed them. He has given to them the great gift of changing bread and wine into the Body and Blood of Christ and administering the Sacraments. It is through His most Sacred Heart, that His life flows through the hands of His holy priests. He has chosen them and He loves them. I hear Him lament over and over again how He is longing and thirsting especially for their love. He has told us over and over again not to criticize the priests for they are His chosen ones, but to love them and to pray for them. It is in this movement as it spreads across the earth that many fervent and holy souls are praying for His beloved priests. For it is through their hands that the grace flows as they administer the Sacraments, as they Consecrate the Host into His Body and Blood. He has said that it is because of His beloved religious that He sweat Blood in the garden, for He longs and thirsts and wants their love. He has chosen His religious in a special way, yet He is rejected by many of them. In the garden, He was comforted the most by the love of the holy priests, by the holy religious, and He was wounded most by their indifference and their neglect. The priest is another Christ in this world. The more he is one in his relationship with Christ, the more grace will flow through him. We must pray-pray as we have never prayed before for our beloved priests. This is an urgent message that Jesus has delivered-that He wants us to pray for the priests. The fire of His love will spread across this earth and many souls will be fed through the hands of the priests. We must pray for the priests. We must spread this consecration. It is through the newsletter that many priests will know more and more about the Heart of Jesus. It is only in going through the pure and sinless Heart of our Lady, that we can go to the very depth of the Heart of Christ, for we are sinners. We must spread this consecration to the priests. 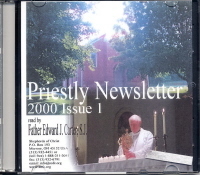 The priestly newsletter is Jesus’ instrument to touch the priests. We see Jesus as He kneels in the garden. His face is covered with Blood and sweat. This is the Almighty God. He loved us so much that He suffered such anguish for us. He is asking us to pray for His beloved priests, to help spread the newsletter, to contact the priests, and to ask them if they receive this newsletter. It is through the hands of holy priests that the grace will flow more abundantly on the earth. Messenger: He has called us, His special apostles, to hear this message. Each and every person in this room has been called by Jesus. Do not focus on me. Open your heart and listen to the message that He wishes to deliver to you. The Almighty God is calling us to help in the renewal of the Church and the world. As we meditate on these Sorrowful Mysteries of the rosary, as we see how Jesus suffered to His brutal death on the cross, why do we not think that He would send messages this day to help in the renewal of His beloved Church to help to lead souls to His most Sacred Heart? There is sickness in the world and in the Church. He is delivering these messages to draw all to the mighty medicine which is His burning love. We are hungry. We are starving. We want to be fed. We will only be fed with the love of God. He is delivering these messages of His love. We are His apostles that He is sending out to the world to carry this message of His love, to light up the darkness. Can we say "no" to Jesus? Open your heart and listen to the message. Do not focus on me. Focus on the message He wishes to deliver to you and meditate on His suffering, how He gave Himself to His death on the cross. It is in consecration that we will have peace in this world. It is in the Shepherds of Christ Movement, as we the apostles press forward to the Church, to the school, and to the family, that hearts will be turned to consecrated hearts. He is calling us His apostles. He is giving us abundant grace to join in such oneness with His Heart. We are His shepherds that He is sending to lead the strayed ones home, home to His Heart. As we take the consecration to the Church, to the school, and to the family, the strayed ones too will be led home, home to His Heart. Why has Jesus chosen us? He has given to us a great grace that He has called us here, that He has given us the desire to consecrate our hearts, that He has given us a desire for the Eucharist and for His life. This is a special grace that He has given us, that we will become more and more united to Him, that He will operate in us for Jesus no longer walks the earth. Jesus is alive. Jesus wants to live in us in a special way and touch the hearts of His beloved souls. Will we say "yes"? Will we open up our hearts, rid ourselves of bitterness and anguish, put aside all of the dividing factors that are in our hearts, and let our hearts be turned into hearts of love as Jesus wants our hearts to be? He is giving to us an abundant grace in the Shepherds of Christ Movement to be one in His Heart. Let us give our hearts to Jesus and Mary. See Jesus, the Almighty God, all powerful, almighty, tied to the pillar. See Jesus, His hands tied, and see the anger in the faces of the men that beat Him. See His flesh torn and the Blood fly into the air. Does Jesus love? Jesus loves us so much, the Almighty God, that He gave Himself for love of us. How we complain about the little sufferings! Are we persecuted? Look at how Jesus was persecuted. He gave the message of His love to this world and He was hung on a cross. Do we expect any different when we go into a world that has rejected Him? See Jesus, look into His eyes as He is tied to the pillar. See the love in His eyes. Even when He is beaten and His flesh is torn, there is love in His eyes. He gave, He gave, and He gave because of the love that consumed Him. This is what He wants of us-hearts of love to give and to give and to give. Oh how we act like Jesus and we give and we give and we give and then we are persecuted and we want to run the other way and cry. His way is to give. He laid His life down for us. He wants us to love that we will lay our lives down for each other, that the priest will give his life for his flock, that the husband will love his wife that he would give his life for his wife, that the parent would love their children this way, that we love one another as brothers in Christ. His way is love. It is not an invitation; it is a command. We were created to love, to love God and to love one another. This is the way to happiness in our hearts. Jesus: You are My beloved apostles of love that I have called in this room this day. Who will I send if you say "no"?. I am Jesus Christ, the Son of God. This is My movement to go into the world to help lead the strayed ones to My Heart. As you go to the churches, the schools, and the families, they will be led through the consecration to Our Hearts of love. You are My chosen ones. You are My apostles. I am giving to you an abundant grace that you will become one in Me. I am begging you to answer this request. You can say "no" and turn away. You can focus on My messenger. You can say it is somebody else’s job. I am calling you this day. On November the 13th, you were called by Me. It is an urgent request that you spread the consecration to this world. This is the good news: if you comply with My Mother’s wishes at Fatima, many hearts will be turned to hearts of love and many souls will be saved. I am begging you to listen to this message. To give yourselves, give yourselves to the Heart of My Mother. It is in her pure and sinless Heart that you will go into My Heart and be united in such oneness with Me. I love you. I love you. I love you. To My death on the cross, I loved you. I beg you, My beloved ones, to help Me to spread the consecration to this world. Messenger: See Jesus at the pillar. See His flesh torn. See how deep the wounds are. See the angry faces of the men that are beating Him, their hearts filled with hatred, filled with the work of the devil. And His Heart was torn within His chest for He loved those men that beat Him and tore His flesh. Jesus: I give you Myself, My beloved ones. This day I give you Myself in the Eucharist. I long and I thirst for your love. I am consumed with love for you. I will never abandon you. I am thirsting, thirsting, thirsting for your love. Will you come to Me and pour your love out to Me? I want your love. I want you to come to Me and tell Me how you love Me. I am God. I am love. I want this love from you. I am alive, I am alive, I am alive and I am treated as a dead object. I deliver these messages to you. I know your heart. I know each heart in this room and I want your love. I want this love relationship with you. Will you say no to Me? Will you turn away or will you give your heart to Me? Will you spend the moments with Me after Communion when I am waiting and longing to be so close to you? Will you tell Me, "Oh Jesus, I love You. I love You. I love You. I love You, God." This is what I want to hear from you. You are longing and thirsting and wanting love, and I have this love to give to you. And you want to give your love, but you are rejected by many. I am waiting for this love. Will you give it to Me? I will never reject you. I will not abandon you. I am your God. You were created to love and to be loved. I am Jesus. I am alive and I am waiting for your love. Messenger: To be wrapped in rapture, in the embrace of the Father, the Son, and the Holy Spirit, to be in that place where there is no wanting, to be in a place where there is total peace, to be wrapped by love itself, to be in the deepest chamber of the Heart of Christ, to be filled with everything, to be satisfied-this is what we will have for all eternity if we love and serve Him. His Heart is a little heaven on earth. He wants us to go to His Heart now and to share in this deep burning love that He has for us, but we are afraid. We do not want to get too close to our beloved Jesus, which keeps us at an arm’s length from Him. He is thirsting, thirsting, thirsting, for love from souls that He loves and how few souls come to Him and outpour their burning love back to Him. How He waits for that one precious soul to come, to be with Him as He is waiting in the tabernacle for that soul to come and to be before the tabernacle and say, "Jesus, I love You. I love You. I love You," to recognize Him as alive and present with His divine love. He wants us to be one in our hearts, but we are rigid. At the Mass, we are rigid. We are not connected. It is in the Shepherds of Christ movement, as more and more consecrate their hearts to the Hearts of Jesus and Mary, that we will be united in one heart, that we will be united in the Hearts of love, the Hearts of Jesus and Mary, that our hearts will burn for love for each other. We are one body in Him. Look at how we are. We beep our horns at each other and say vile things and many curse the Lord. Are our hearts cold or are our hearts a burning furnace as Jesus wants us to be? Jesus: You are My soldiers of love. I am asking you this day to consecrate your hearts all through the day. To give yourself to Me. I am Jesus. I gave Myself for love of you. Messenger: See Jesus at the pillar and experience in all your senses this picture. Do you hear the blows as it hits the flesh of Jesus? Do you see Him clearly with your eyes? Do you see the light in the room. Do you hear the angry cries of the men? This is the Almighty God, bound at the pillar, in a human body, nailed to a cross. At any second, He could have released Himself, but because of His furnace of burning love within His most Sacred Heart, He gave Himself for love of us. Jesus: I am Jesus. I am giving Myself to you this day, but I am rejected and forgotten and ignored, treated with indifference, treated with hatred. I am treated as a dead object. I am calling you, I am alive, I am alive, I am alive and I am begging you, My beloved apostles, to spread the good news to this earth. Many souls will suffer the pains of hell forever and ever. And as you spread this consecration, hearts will be turned to hearts of love. I am alive and I live in you. Song: "Come Unto Me All Who Are Weary..."
Jesus: The time is at hand for many souls this day will be condemned forever to the fires of hell. You can forget your brothers, but I will never forget you. I love you, My beloved ones. I loved you to My death on the cross. Messenger: Jesus wanted me to read this message. This is from May the 4th in the third Blue Book. Jesus: "Dear ones, I am calling you to love your brothers. I have loved you. Would you, dear ones, lay down your lives for your brothers? How are you loving this day? Are you following Christ in your actions? I am the Way, I am the Truth, I am the Life. You must constantly put the world aside and look to the Master for all your directions. I call you, My little ones, to holiness. I call you to pure hearts, hearts that are full of love and empty of hate and anger. I call you to guard your hearts and watch that they stay forever holy. You, My precious bride, I want your soul white. Do you criticize your dear brothers? I gave the last beat of My Heart and the last drop of My Blood for the soul you are displeased with. I would die for them this day. Will you not love them for Me? They are so precious to Me! Quit sizing up your brothers. You do such unloving things in your mind. You do not even know how unloving are your thoughts. You judge your brothers by their exteriors, by their education, by their money. You do not see the beautiful creation of God the Father. He created your brothers just perfectly and He loves His creation. Who are you to criticize His creation? Love your brothers when they are hurting. It is in your loving the hurting ones that they will see the reflection of Christ in you. Do not hold on to foolish things. One moment and your days on this earth have ended. All that remains is how you loved. Did you love God? Did you love your neighbor? Love is not selfish. It gives of itself. Its whole purpose is to draw the other closer to Jesus. Study the crucifix. It is such a comfort! I loved you so. I died for you. I would die for you alone this very day, little ones! Look at Me dying on the cross! The way to Me is to follow Me. Be Christ-like in your ways. You must study Me to know My ways. Do not give in to yourselves. My way is love. Will you be the reflection of the love of God within you? My way is the way of the cross. They persecuted Me, they hurt Me, they tore My flesh and spit on Me. They did this to Me for My love given to all! This world is not your end. You follow My ways and you move as you should toward your goal. I am Jesus, I am the Son of God. I love you so ardently. I died and shed My Blood, My beautiful Blood, for love of you. I await you this day, My little ones. I loved you so I remain with you in the Eucharist. I await, I long for you to come and share in our love. I am the tenderest of hearts. No man can be close to you as I. I love you so. I want to dwell and live within you. I want to fill you with all My love and radiate My love to your beloved brothers. I want to shine from your souls. Oh, little ones, take Me seriously. I am truly here, begging for you to live in My love. You are the light that will shine in this dark world. You will light up the darkest night with My love. The best gift you can give to this world is to busy yourself about your love affair with Me. I love you, My little ones. I love you and I want to share this love with you. Love your brothers. Do not let Satan talk in your heads and make them wrong and you right. Love them as I have loved you. Do not look at your brothers and size them up. See them with the eyes of God, the beautiful creations of the Father. Will you love My beloved ones for Me this day, or will you say "no" to My call? Love your brothers in darkness. They need your love. I am calling you to love them for Me this very day. They may scoff at you and persecute you, but you will plant a seed that I Myself will water and give sunlight to. Plant seeds of love. This is the most important seed you will plant, a seed of love. Watch it grow as I provide it with water and nourishment. I will shine on your brothers through you if you stay in My love. Be the light that shines on this dark world. They are crying out for the love of God. They are suffering. They need your love. Put yourselves aside. Die to yourselves. Live only for the love of God. If the world goes one way, you stay focused on My love. Do not follow the world. Follow the risen Christ! I love you so, little ones. I bring you new life. I fill your hearts with My love. Pray to the Holy Spirit for His gifts. Pray the Our Father. Let My Mother mother you as she mothered Me. She loved you so. She suffered so for love of you. She appears to bring you back to her beloved Son. Will you answer her call? She is calling you to put God first in your life. She is calling you to love, love of God, love of one another. Forgive your brothers. Empty your hearts of hate and anger and let go. Let all your anger go. Give Me your resentments and let Me heal your hearts. Forgiveness is the way to peace. Let go. Do not size up your brothers. Love them all. Pray for them. Unite in My love. Love is a miracle cure. Say you are sorry. Be gentle in your ways. Pray for your needs. I love you, little ones. I am with you this day. Will you answer the call and love for Me? I love you. I am your beloved Jesus. I would die this day just for you. I love you the same as I did the day I died. Turn to Me and give Me your life. I will care for you and love you. I am your Savior. I am Jesus Christ, Son of the Living God. Let Me live in your heart!" Messenger: See our beloved Jesus crowned with thorns. See the men as they pound the thorns into His skull. Did He call out? Did He say, "Why are you doing this to Me?" Do you hear Jesus? Does He scream as the men pound the thorns into His head? Jesus was silent. Think of today, all the sins of pride that are in the hearts of men, all the ugly thoughts within the heads of men. Jesus paid the price for the evilness in our hearts and the thoughts in our heads. It is in consecration that our hearts are turned to hearts of love. Mary told us at Fatima that we must give our hearts to her Heart and to the Heart of her Son if we want to have peace in the world. The devil is busy. He is going into the hearts and the minds of so many young children, people in all walks of life. It is our job. Jesus has given us this job: to spread this consecration. Mary, our Mother at Fatima, has asked us to go to the churches to try to set up Shepherds of Christ chapters in which people are praying in one mind and one heart for the priests, for the renewal of the Church and the world. She asks us to go to the schools, to take the rosary and the consecration, to teach little children to tell Jesus they love Him, to give their hearts to Jesus, to tell Mary that they love her and give Mary their hearts. How many things do we teach the children on this earth today with the computers, with the school, with everything that is so important? Yet we do not listen to the words of our Mother and teach them about the consecration. Mary appeared to me everyday for nine months asking that we spread this consecration to the children in the schools. This message is for you this day. She asked me to ask you to help to spread the consecration to the children in the schools. Song: "Jesus we love You, Mary we love you..."
The Almighty God withstood the greatest torture for love of us. We do so many things that seem so important, but we do not listen to the words of our Mother, Mary, given at Fatima: that we will not have peace in this world until a sufficient number of people have consecrated their hearts to the Hearts of Jesus and Mary, that we must pray the rosary and do the first Saturday devotion, and make reparation to Their Hearts. Satan has blocked this message. Satan will work in our hearts so that we will not want to carry out the messages that Jesus is delivering in this rosary. The message is that this is urgent. The time is at hand. Many, many, many souls are falling into the fires of hell. This is the good news: that we take the consecration to the churches, to the schools, and to the family. We will help in the salvation of millions of souls. The Shepherds of Christ Movement is His instrument for the renewal of the Church and the world. It is greatly centered in the completion of the Fatima message and these rosaries on the 13th are very important to the completion of the Fatima message. They will be taped and sent to all the chapter members. They will hear the message of Jesus and help spread this consecration to every corner of the earth. When priests’ hearts are consecrated to the Hearts of Jesus and Mary and celebrating the Holy Sacrifice of the Mass, the fire of His love will spread across this earth and many will love Jesus with such love. For it is through the hands of His holy priests that we are fed. The world is starving for the love of God. We must pray as never before for our priests. We must take the priestly newsletter to the priests and tell them about the prayer chapters, nothing about private revelation, just praying, praying the prayers in the Prayer Manual. Jesus’ head was crowned with thorns. He suffered so much. Can we answer this cry of our beloved Savior? Can we answer the cry of our Lady and take the consecrations to the churches, to the schools, and to the family? Jesus: I thirst, My beloved ones. I thirst for a drop of heartfelt love from many of My beloved priests. You must pray. It was the holy priests that comforted Me so during My Passion and I suffered so for those that do not show Me their love. I am alive. I am alive. I am alive. I am treated as a dead object. Will you spread My messages of love to this world. This is the mighty medicine for this world-My burning love. Messenger: Mary kept all these things in her Heart. Be in the Heart of Mary as we meditate on this mystery of the rosary. Be in the Heart of Mary. See through her eyes her beloved Son as He carries the cross on His back and as He falls to the ground. Be in the Heart of Mary and feel her suffering. Feel the sword pierce her Heart as she looks into His eyes and she sees His eyes covered with Blood and the wounds all over His Body. Be in the Heart of Mary for Mary appeared every day for fourteen months and delivered these messages to me that many souls are going to hell. It was an urgent cry. I do not know any other way than to tell you this message but it burns in my heart and my heart is pierced with a sword, for you speak and you speak and others do not hear, but you know, and the Almighty God has given these messages to you, and Mary has appeared over and over and over again. Will you help, will you help to take this message that They have given to me and to you into this world? For nine of the fourteen months, she focused on the importance of taking the rosary and the consecration to the children. Jesus is asking us to reach the children in the schools with this rosary and consecration. Jesus said to the women of Jerusalem, "Weep not for Me but for yourselves and your children." Mary said, "How hard are the hearts of so many children." How can we teach our children all these things and not teach them about the love of Jesus and Mary. Do we see Their eyes meet? Do we know the suffering that Jesus and Mary suffered? Do we care? And we know that we will suffer when we go into this world to spread this message, but the time is urgent and souls are being lost for all eternity. See Jesus and see His chin hit the ground. Look into His eyes. See His love. See the crown of thorns on His head piercing His most precious head and the Blood running down His face. See the wounds all over His Body. He showed us the way. He gave His all to His death on the cross. He wants us to love one another that we would be willing to give our lives for one another. We are not loving the way Jesus is telling us to love. We are His chosen ones, and He is revealing to us the mysteries of His Heart. He withstood torture, but the greatest agony was not the torture and the wounds to His Body. It was what He suffered to His Heart of pure, divine love for He loves, He loves most perfectly each and every soul. Consumed with love, He calls out, "I thirst. I thirst. I want your love." Do we go to Jesus and outpour our love to Him? Do we realize that He is longing for this love? Song: "I watched Him as a baby..."
Mary is calling our name out in the dark night of this world. We are the lights that Jesus and Mary want to send into the darkness with our hearts lighted with His love. Will we answer this call? Will we spread this consecration to the far ends of the earth? Do we want peace? Then we must do what our heavenly Mother has told us at Fatima. Look at the wounds of our beloved Savior. How do we suffer? Do we complain? The world is not like us. The world is so different than us. We must be strong and pray for the grace to do whatever He asks us to do. Messenger: See the withered Body of Jesus as He hung on the cross. See the nails in His hands and His feet, and think of the angry men that pounded these nails into His hands and His feet, the angry men that crowned our beloved Savior with a crown of thorns, the angry men that beat Him. Think of how Jesus is treated this day. Jesus suffered. He suffered the wounds to His Body, but His greatest sufferings were not the wounds to His Body but the wounds to His Sacred Heart, the Heart of most tender love. Think of how He is treated today, how He thirsts for heartfelt love. We are His chosen apostles in the Shepherds of Christ Movement. He has given to us a great grace that we will be ever closer to His Heart and to His Mother’s heart. He is thirsting for our love. See Jesus hanging on the cross. See how He suffered and how much anguish He is in. See the hurt in His Heart, and then think that the love that we give to Him this day is His comfort in all of that bitterness. I looked at the window at the Center where Jesus was tied to the pillar and I was crying, and I said to Jesus, "Jesus, what were You thinking of when they were beating You on Your back?" And He said to me, "I was thinking of you sitting in the pew and telling Me how you loved Me." The perfect match, the desire within us to be loved, to be loved by the Divine God. But we do not see. We do not comprehend. We go every place and look to try to satisfy this craving within us-the perfect match. And He is outpouring His divine love. 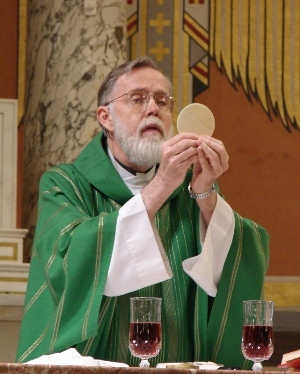 He is giving Himself to us in the Eucharist. He is waiting for us in the tabernacle to come to give us an abundant sharing in His life-the perfect match. We long for love and He has the divine love that will satisfy us-the perfect match. Jesus is love. He is thirsting for our love. And we want to give ourselves, give ourselves. And we give ourselves here and many times we are rejected so we hold back and put up walls. When we give ourselves to Jesus, He accepts all our love. He wants us to give ourselves completely to Him. Our little heaven on earth-the Hearts of Jesus and Mary. Will we help to lead the strayed ones home, back to His Heart? He is giving to us this great grace in the Shepherds of Christ Movement to help us to carry this consecration to the world. He is feeding us with these messages, with these rosaries that we will be on-fire for love of Him and that we will go into these institutions and not be afraid and tell them about the love of the Hearts of Jesus and Mary. Stand beneath the cross of Jesus. Be in the Heart of Mary. Experience what Mary experienced in her Heart as she looked at her Son, as she saw Him covered with Blood, withered, and suffering, moments before His death. Be in the Heart of Mary as she cries out as she did to me over and over again about her lost children, that would go to the fires of hell, despite all that He did. And hear her pleading as I heard her pleading to please, please go into the world and to reach the children, her little children that are suffering and in pain. What do we think of when we look at the cross of Christ? Do we realize that we carry out His life, death, and resurrection in our lives, that He died, that He rose to give us a sharing in His life, that He ascended into heaven and He no longer walks this earth? He came to show us the way that we would be His shepherds this day that would lead many to His most Sacred Heart. We are His apostles. We must pray to the Holy Spirit for the fearlessness to go into this Godless world and to carry the message of His love, for this is the good news. The more we spread this consecration, the more hearts will be turned to hearts of love, and as Mary, our Mother, promised, there will be peace when a sufficient number have consecrated their hearts to the Hearts of Jesus and Mary. There is not another way. We must do as she has told us to do. This is a major part of the completion of the Fatima message. We must take this mission to our hearts. We must give ourselves to Mary. It is in her pure and sinless Heart, despite our sinfulness, that she will take us deeply into the Heart of Christ and we will be one in Him, that He will operate through us and touch many of the souls in this world today that are hurting and in pain. This is a call from our beloved Savior. If you continue to focus on me, you will miss the message. This has been my fate for all the years, over five, that I have received these messages. The focus is on me, the words, and the English, and we miss the message. This is the message of Mary at Fatima that we must go into the world, carry the consecration into this world, pray the rosary, we must observe the first Saturday devotion, and we must make reparation to Their Hearts. Jesus: I love you. I love you. I love you. To My death on the cross, I gave Myself to you. I give Myself to you today. This is My Body that you receive in the Eucharist. This is My Blood. Will you give yourself to Me? I will never abandon you. I will give you My Divine love. You will never be alone, My beloved one. I am with you forever and ever and ever. Will you help Me? Will you help spread My love to the hurting world. Will you take the messages that I have given in the Blue Books to this world and tell them that each and every word is My message of love that I give to them? These are rosaries from the Hearts of Jesus and Mary. This rosary I have given as a tool to help to teach you so that you will be ever joined closer to My Heart. I love you. I love you. I love you. I am Jesus, your beloved Savior. Jesus: My love is alive and I am present in the Eucharist. When all enkindle a deep and ardent love affair with Me, it will be I Who operate from their souls. They are all afraid. They are depending on themselves. They are closed and shut down. They live from their heads and not from their hearts. I am on fire with love of them. When they come in the Eucharist and open their hearts, I fill them with My fire. My love affair with them takes time, time after Communion, time in front of the tabernacle. Those who want to tell you things do not spend all day in prayer with Me. They are full of self and full of fear. I am making you selfless. I want to possess your soul. When you operate from self, you get yourself. You are a mere human. When I possess your soul, I, God, operate from you. The Church is dying in spirit. You are going through motions. I am alive and I want to love you and live in you. The mighty medicine is the love of Christ radiating with fire from the hearts of all. I want My Church to sing songs from their hearts. Songs create emotion. Love is emotion. Sing songs from your heart, love songs to Me. Read the readings from the love you have enkindled in your hearts for Me. The word of God is Life. How is it read? Feed the people through the word of God. Read it with such love. Love My words. Love Me. You do not love Me. You go through motions. I want an on-fire love affair with you. I am waiting for our love. The Mass is the most glorious event. You need to love the Mass, love to pray it, love to sing it, love to be there, wait to go and look forward to it all day and anticipate our union in Communion with breathtaking feelings, "Oh, God comes to me! My ardent lover comes into My body!" Oh, you are all turning numb and I give you so much. Yet you run after foolish things. God comes to you in the Mass. Preach the love on-fire, the ardent love of God, to My little ones. I am Jesus, the Son of God. I was born a mere human for love of you. I died for great love of you. You are missing the emotion. I gave My life for love of you! Come and share our love affair. I wait, I wait, I wait. You are cold, you are indifferent. I loved you to My death. Get these letters out. Every day souls are being lost while you deliberate. The Church is full of fear. Do you think I would come this way and then not give you what you need? Masses are being said that could be on fire. Every day lost is so much time. You are getting your affairs in order for this life. It can go up in smoke in an instant. You are wasting valuable time. These messages need to circulate. You need time in front of the tabernacle, not l0 minutes. You need to read these messages. I, God, talk to you and who listens? You are so full of self, so attached to this world. You do not want to give up your ways. You will suffer. You will have to give up your ways. You are wasting valuable time with these messages. Souls will be turned around. It will spread like wild fire. I am alive. This message on the Mass would change the way you attend the Mass. Who sees it? Who knows? You are full of self. You get up and read the Word of God and think about yourself. You sing the songs and think about your voice. You do not sing from the heart because your lives are centered on yourselves. You are attached to your lives. You do not have time to come and be with Me. I tell you to be selfless. I tell you to surrender. I tell you to quit doing it yourself. You continue to operate the way you want. You do your own wills. I tell you to be selfless. Live for God first. I am the Lord, thy God. Thou shalt not have any gods before Me. When I am first in your lives, everything else works out. When you read the Word of God because of your love of God, that is when the world will feel the love of Jesus! Listen, My precious ones, I died for you because of My intense love for you. I was born a mere human because of My intense love for you. This is emotion. I want you to love Me. I call you to love. Do you love Me or just throw little prayers at Me? I want the love of an ardent lover. I want you to think about Me with such burning in your chest. I want you to talk about Me. I want you to want Me. This is love. I call you to love God. Do you love Me? When you love God, you will love your brothers. You are missing our love affair. I am on fire for love of you. If you stay away, then you are missing the most important affair in your life. I want love, love in the Mass--fire when you attend, love in Jesus in the Eucharist. I am God and I, God, come and dwell in your breast in Communion. These are the most golden moments of your life. I am God. You have Me in your body. This is when you need to be with Me. I love you so much! Come and receive Me daily. No one knows the gift of the Mass and Holy Communion. Nothing is more important than Jesus, the Son of God, in your breast. You are missing the most important event in your life. I, Jesus, come into your body! How is your body? Is it pure? Is your tongue clean for Me to enter there? Oh, sweet ones, you hold all you need. You are running down senseless roads. You are holding on to things that will vanish in an instant. I am all that matters. The greatest gift you can give to this world is to enkindle a deep love affair with Me. When I possess your soul, My love is emitted from your very being and that love is a life that cannot be contained. Come to Me and love Me. You will set this dark world on fire with the love of Jesus. You will shine and all will see your light, for My light is the brightest light. Come to Me. Pray the prayer for union with Jesus all day. Oh, How I love you! Jesus.